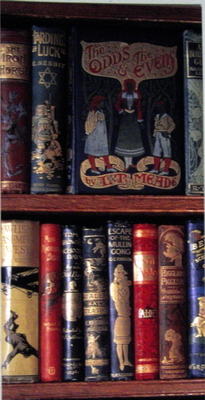 Is it just me, or do you love the look of old books? This is a bookmark sent to me from my sister-in-law Kathie. Stunning statements for any room. Love your selections!! Cannot understand the trend in home decor magazines of turning books around, so that the pages are seen and not the spines. Those are gorgeous bookmarks — thank you for the link! I should have known you’d like fun bookmarks as much as I do. Hmm….food for thought for future birthday gifts! I was just given one that is a string with glass beads at either end–have you seen these? I love it. Carol, here is another post my son will love. We love good, old books — and their covers, too. Just minutes ago Kyle and I were admiring some Tom Swift and Oliver Optic books on eBay. The Optic ones were particularly stunning.We simply must get some of those die cut fridge magnets! Oops, Dana, didn’t mean to copycat your choice of words — “stunning” — although it is fitting for these beautiful books, isn’t it? Carol,That is so beautiful! Thanks for sharing it with us. And, thanks for the movie review. I don’t know that I’ll watch it though. I’m not much of a made-for-tv movie person, but I do also, like to look for the larger meaning in movies. In fact, I recently saw Atonement in the theaters and wrote about it on my blog because it haunted me for a few days. While it wasn’t a happy movie it definitely made me think, which I appreciated.Kindest regards. 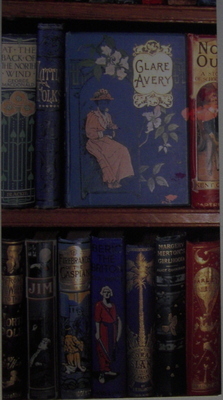 My husband and I both love antique books~no smelly ones, please! We usually go on one short “booking” getaway each year to feed our habit. As time goes by, we are more and more selective and we come home with less and less. But a single gem is sometimes worth it all, and the hunt is such fun! Yes, Poiema! I love the hunt. In planning for our trip to the UK I’m trying to decide which books I really want to look for. I want to get more of O. Douglas (Ann Buchan) whose books should be readily available in Scotland. A single gem is worth the hunt, though. So satisfying. The book (The Romance of Industry and Invention) mentioned in one of my economics posts hails from this era (pub 1894) and the cover is remniscent of the ones in your photos, albeit faded.